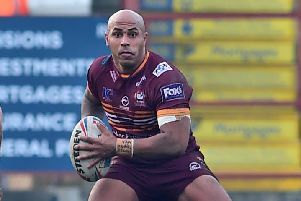 Local rivals Batley Bulldogs and Dewsbury Rams will go head to head in Blackpool at next year’s Summer Bash. The League One Cup final will kick-off the action at Blackpool FC’s Bloomfield Road ground during the Bank Holiday weekend of May 27 and 28. And it will be the derby between the Bulldogs and the Rams that will close proceedings on the Sunday afternoon. RFL Chief Operating Officer Ralph Rimmer said: “The Summer Bash is always a fantastic event and one that many fans love to attend. Last year 16,000 passionate fans came to Blackpool and watched some outstanding action. The Summer Bash fixtures - Saturday, May 27: League One Cup final (noon), Oldham v Rochdale Hornets (2.30pm), Featherstone Rovers v London Broncos (4.45pm), Bradford Bulls v Hull KR (7pm). Sunday, May 28: Swinton Lions v Sheffield Eagles (12.45pm), Toulouse Olympique v Halifax (3pm), Batley Bulldogs v Dewsbury Rams (5.15pm). Tickets can be purchased by visiting www.rugby-league.com/tickets or by calling the Rugby League Ticket Hotline on 0844 856 1113.